A Chorus of Women has been singing since 18 March 2003 when 150 women filled the Australian Parliament with a lament for the people of Iraq as the Federal Government announced that Australia was going to war. The Lament was a national and international media event. See the 7.30 Report coverage from the day. We continue re-sounding current meanings of the role the Citizens’ Chorus played in the ancient theatre of Athens when democracy was new. A Chorus of Women has given hundreds of public presentations of original music, drama, and civic conversations about the great issues of our time. Our repertoire has grown to more than 70 original songs and numerous major productions, and we have produced three CDs and two DVDs and A Chorus of Women Songbook for Citizens. We always welcome new singers. The joyous Song of Life sounded from thousands of Canberra voices in a flashmob at the 14 April 2019 Refugee Rally in Garema Place. We gathered a citizens chorus of more than 100 singers and instrumentalists who secretly practised Johanna McBride's arrangement of Beethoven's Ode to Joy for four-part choir and instruments. The lyrics for the occasion were written by Glenda Cloughley. When Tim Hollo started the calls of 'Freedom!' the crowd sang back in delight. Many joined the singing of the beloved tune, using postcards of the lyrics. Soloists Tobias Cole and Glenda Cloughley led the citizens chorus under Johanna's direction. The singers came from many Canberra choral groups, showing the networks of great goodwill and humanity in our beautiful city. The fine instrumentalists who enthusiastically participated were Rowan Harvey-Martin (violin), Fiona Dickson (flute), Georgie Baron (clarinet), Lucus Allerton (piano), Gillian Pereira (cello) and Max McBride (double bass). When the song came to an end there were immediate shouts for 'more' from the crowd. So the whole company gave an encore of the jubilant end. Watch this space for images and a video recording. In our next big production, The People's Passion, we are singing up the transforming potential of compassionate wisdom and women's leadership. The performances will be held on the centenary of the disastrous Treaty of Versailles, 28 and 30 June 2019. Singers are very welcome. See our report of the 2018 production. Go to our What's New page for details. We presented three performances of A Passion for Peace with some of Canberra's finest singers and instrumnetalists during the inaugural Festival for Peace 28 April - 2 May 2015. Bank details for electronic transfer are on our Contacts page. We sing this haunting song every year on 24 April during the Anzac Eve Peace Vigil. Click here for a professional recording. See the 'What's New' page for the 2019 Vigil. Watch our YouTube video. It was our centenary birthday present to the Women's International League for Peace and Freedom. 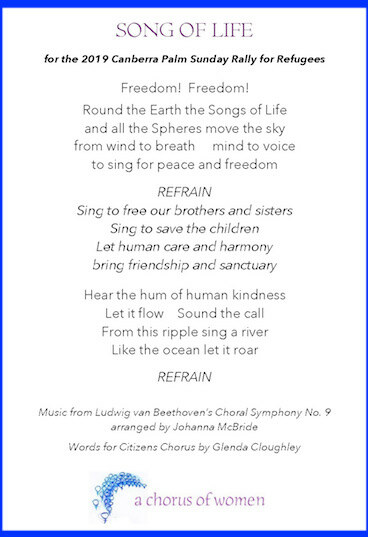 In this joyous song we celebrate the courageous women who gathered in International Congress of Women in The Hague in April 1915 and all women who work for peace today and always. Click here for our CD of 'I Am Ethos' which we launched in 2013 as a centenary gift to Canberra. Click here for the double live CD set of 2009 premiere performances of 'The Gifts of the Furies', our Canberra grown mythic story song about the crisis of climate change. Click here for 'Giving Voice', our first CD released in 2006. In our 10th anniversary year we published a songbook of more than 40 songs written by Chorus women from 2003 to 2013. The main themes are peace and democracy, and care of the Earth.